The Cleveland Cavaliers tied the NBA Finals with a 115-101 win over the Golden State Warriors to send the series to a seventh and final game in Oakland. It was the second straight elimination game for the Cavaliers, and for the second straight night, they were led by a Herculean effort from LeBron James. James dictated every aspect of the game en route to 41 points, eight rebounds, 11 assists, two steals, and four blocks, looking clearly like the best player on the floor. Meanwhile, the Warriors looked rattled, effectively losing the game in the opening minutes of the game as the Cavs stormed out of the gates to a 20-point lead. At one point in the second quarter, James and Stephen Curry, the two faces of the league, collided going for a loose ball and ended up on the ground. Getty photographer Jason Miller caught the moment in a photo that perfectly captures the way this series has turned (though James was actually called for a foul on the play). James, far bigger in size than Curry, is on one knee, getting up, recovering from the collision. 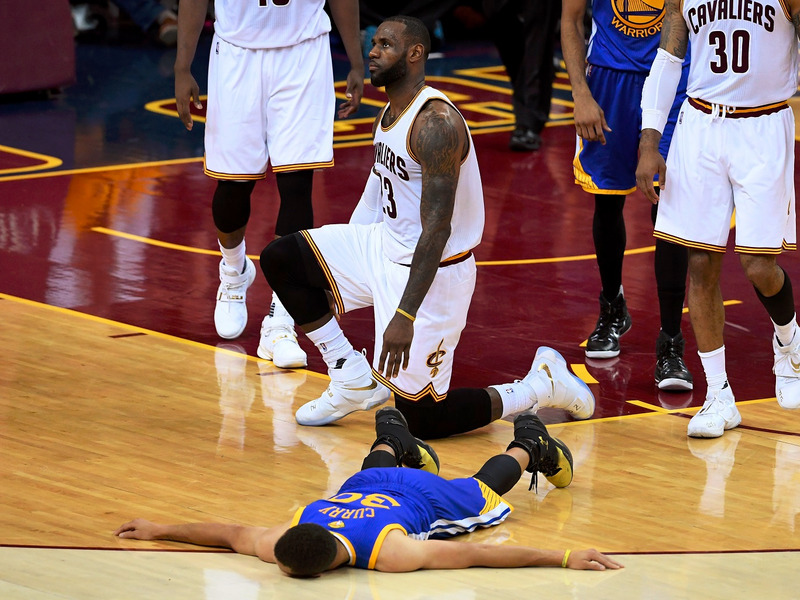 Curry, meanwhile, is sprawled on the ground, looking exhausted, depleted, as he has for much of the postseason. While Curry and the Warriors have fallen flat in the last two games, James and the Cavs have risen to the occasion.